Christmas Time In The Special Ed. Classroom | Mrs. P's Specialties! I'm always amazed that the holidays seem to appear out of nowhere. None the less, I L-O-V-E Christmas time!!! It's the perfect time of the year to add fun into lessons, get kiddos up and moving and to teach about kindness. 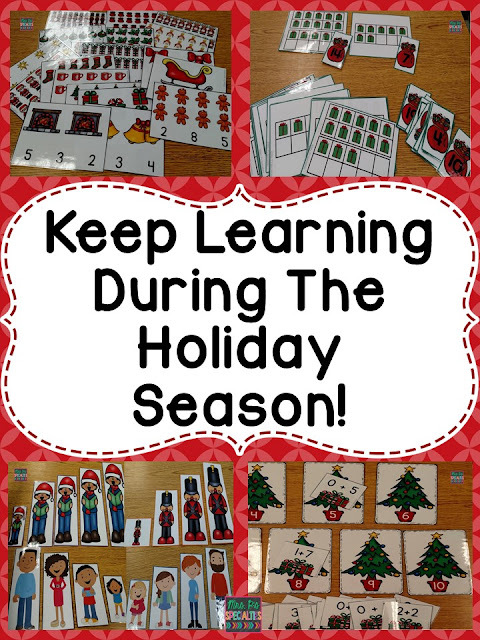 Today I am highlighting some of the activities that we have fun with in December. My kiddos that are working on sets and one to one correspondence use these clip cards. With these clip cards, we work on math and fine motor skills. I also have a group of students who have moved on to adding. In this task, they have to sort the addition sentences to the tree that has the correct answer. We also work on numbers and tens frames. We practice tens frames regularly to help students become more automatic in identifying the tens frame. You can easily adjust the level of difficulty by putting out fewer tens frames and numbers. Students can work up to matching all of them. As a group, we read books about what you can do with family and what you will see during the holiday season. There are matching picture cards for each book. We use these for all sorts of things. While we are reading the book, I ask students to take turns matching the picture. This helps students stay engaged in the lesson and adds a hands on component. My kiddos love anything hands on! We also use the pictures to sequence after reading the book and to practice answering questions. Afterwards, we work on similar vocabulary with our easy readers. Finally, we also do 2 types of write the room. In the more traditional version, we hunt around the room for the words and write or trace the matching word label. There are two different recording sheets, so all of my kiddos can participate at their own level. We also reinforce counting and number skills with the count the room version. The materials used in this post are from THIS SET. So there you have it....I stay sane during this crazy holiday season by adding in lots of fun! How do you stay same?? Visit Mrs. P's Specialties's profile on Pinterest. Please read our privacy and affiliate policies prior to using our website.